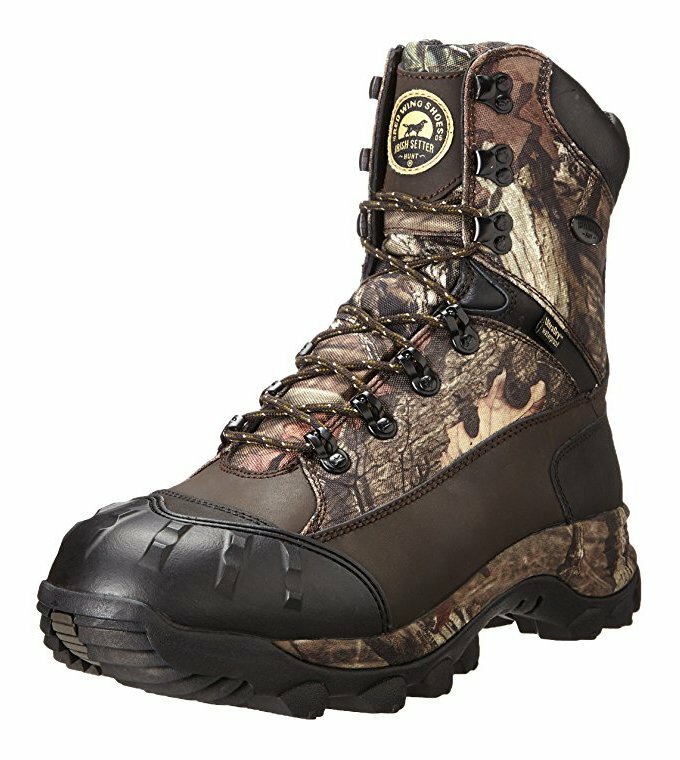 With its ruggedness, durability and waterproof construction, the Irish Setter Men’s 2859 Grizzly Tracker 9″ Hunting Boot is a very popular boot among many male hunters – especially those who often find themselves hunting in swampy or wet terrain. In this post, we shall be taking a look at some of the principal features of the Irish Setter Men’s 2859 Grizzly Tracker 9″ Hunting Boot that endear it to many hunters. In addition to the boot’s main features, the review shall also cover some of its main pros and cons as well as the top customer FAQs. Hopefully, at the end of this Irish Setter Men’s 2859 Grizzly Tracker 9″ Hunting Boot review,you will understand why many hunters include the boot in their lists of favorite hunting boots. 1.8.1 Q. Are the boots insulated? 1.8.2 Q. Are they steel-toe boots? 1.8.3 Q. Who are the manufacturers of the boots? 1.8.4 Q. A number of leather boots from Irish Setter incorporate the renowned ScentBan™ which is responsible for killing odor-causing bacteria in boots. Does the Irish Setter Men’s 2859 Grizzly Tracker also come along with ScentBan™? 1.8.5 Q. Do the boots come with Irish Setter’s famous SnakeGuard construction, which protects the wearer from snake bites and other sharp elements from penetrating the boot? 1.8.6 Q. What is the height of the boot? 1.8.7 Q. How do I clean the boots when they get dirty? 1.8.8 Q. Can I use soap to clean the boots? 1.8.9 Q. What is the best way to store the boots? 1.8.10 Q. What colors do the boots come in? The Irish Setter 9-Inch Lace-Up Grizzly Tracker incorporates the renowned abrasion-resistant technology ArmaTec™ to ensure it remains in a good shape for a longer time. The placement of ArmaTec™, which is an extremely tough and resistant protective covering, in the boot’s high wear areas plays a very instrumental role in lengthening the lifespan of the boot. With these boots, the hunter does not have to worry much about slipping and falling when traversing slippery terrains thanks to the fact that the boots come with rubber soles that have claw-like gripping ability on any terrain. Hunters who often find themselves on sloppy and slippery terrains will undoubtedly appreciate the excellent traction and support that the boots come with. The boot is totally waterproof thanks to a combination of factors, including the fact that they are made of leather and nylon and have rubber soles. Also, the boots incorporate Irish Setter’s renowned UltraDry™ waterproofing system, which effectively blocks water and snow from entering into the boot yet allows perspiration out of the boot in order to enhance the comfort of the wearer . This means a hunter can comfortably trudge through muddy and wet areas without worrying about a single drop of water coming through the boots. The boot is equipped with Irish Setter’s exclusive scent control technology known as ScentBan™. The ScentBan™, which is very effective in killing bacteria responsible for causing bad odor, is added to a number of materials used in making the boot such as the footbeds and linings. The presence of ScentBan™ not only saves the hunter from developing foot odor when wearing the boots, but it also helps in making the hunting expedition more successful since by controlling scent, it conceals the hunter’s location from animals, who can easily use scent to detect the presence of a hunter and escape. If animals can’t perceive the scent of a hunter, then their likelihood of noticing his presence and escaping is drastically reduced. The boot also comes with 1000g of 3M Thinsulate™ Ultra insulation, which is primarily responsible for keeping the feet warm and comfortable all day. This means that even during very cold temperatures, the hunter is assured of warm feet all day long. The boots are totally waterproof. Despite being very durable, the boots are also very light. They contain ScentBan™, which means they inhibit foot odor. They are warm and very comfortable to wear. They have very good traction on slippery terrain. Their breaking in process doesn’t take too long. They are reasonably priced for all the functionality they come with. Boots tend to make pretty annoying squeaky noise sometimes. They are not steel-toed boots. Q. Are the boots insulated? A. Yes! The boots are insulated. As a matter of fact they contain approximately 1000g of 3M Thinsulate™ Ultra insulation. Q. Are they steel-toe boots? A. The boots are not steel-toed. A. The Irish Setter 9-Inch Lace-Up Grizzly Tracker is from the Irish Setter Boots of the iconic Red Wing Shoes, an American footwear company that has for several decades been involved in the business of designing and manufacturing very high-quality leather boots. Q. A number of leather boots from Irish Setter incorporate the renowned ScentBan™ which is responsible for killing odor-causing bacteria in boots. Does the Irish Setter Men’s 2859 Grizzly Tracker also come along with ScentBan™? A. Yes it does come with Irish Setter’s famous ScentBan™, which has the capability of swiftly eliminating all odor-causing bacteria in the boot’s interior. Q. Do the boots come with Irish Setter’s famous SnakeGuard construction, which protects the wearer from snake bites and other sharp elements from penetrating the boot? Q. How do I clean the boots when they get dirty? A. The cleaning process is indeed a very simple process. Whenever your boots get dirty you can use a piece of cloth and water to clean the boots. After cleaning the boots, you can move to the final phase of the care process by applying good conditioners and leather protector on the boots in order to give them the utmost protection. It is imperative to remember that taking proper care of the boots will make them last longer and perform better in the field. A. If you notice your boots are extremely dirty, you can use soap in the cleaning process. But it is important to know that the soap you use on the boots should be a non-scented soap. A. The best way to store your boots is to place them in a place that is cool and dry. Also, you should make sure that in storing the boots, they have no direct contact with sunlight, extreme heat or extreme cold. Q. What colors do the boots come in? A.The Irish Setter Men’s 2859 Grizzly Tracker 9″ Hunting Boot can be purchased in the Mossy Oak® Break-Up Infinity® camouflage pattern. These boots are not only durable but they are also capable of providing the hunter with comfort in any terrain he finds himself. In addition to the numerous advantages these boots offer the hunter, they are also pretty light, which means you can spend hours in them without feeling any discomfort or fatigue.